As Florida finally breaks 90 degrees for the first time this year, we know summer is officially on its way! As such, we’re a little bit stuck on Pinterest shenanigans that bring us back to the days of running through sprinklers, going to the beach, afternoon thunderstorms and sunny days. Finals week is next week and we’re practically begging the summer semester to get here already. Mix up your cake mix in a big bowl. We decided to expand on the original pin and make our actual cupcakes rainbow colors. Obviously, you don’t have to do this, but it lends a nice touch. Put a small amount of cake batter into a small bowl (or in our case, a shot glass- this is where the pun comes in). 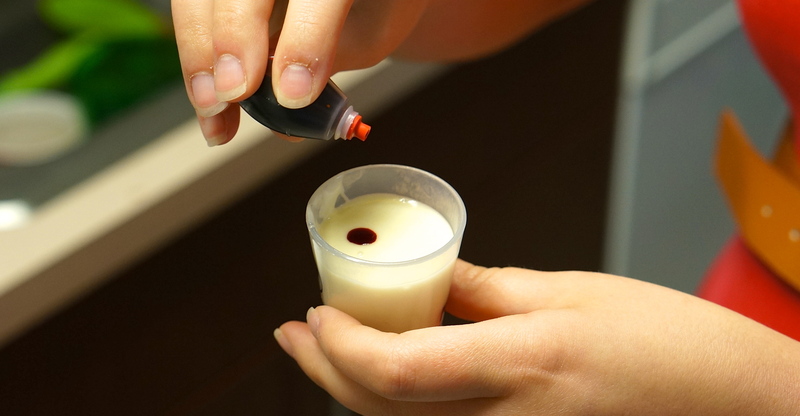 Add a few drops of food coloring and stir. Repeat until you reach the color you want. Just so you know, a full shot glass holds about 3 mini cupcakes worth of batter. Line your mini cupcake baking sheet with your cupcake liners and fill each pocket about 2/3 with cake mix. 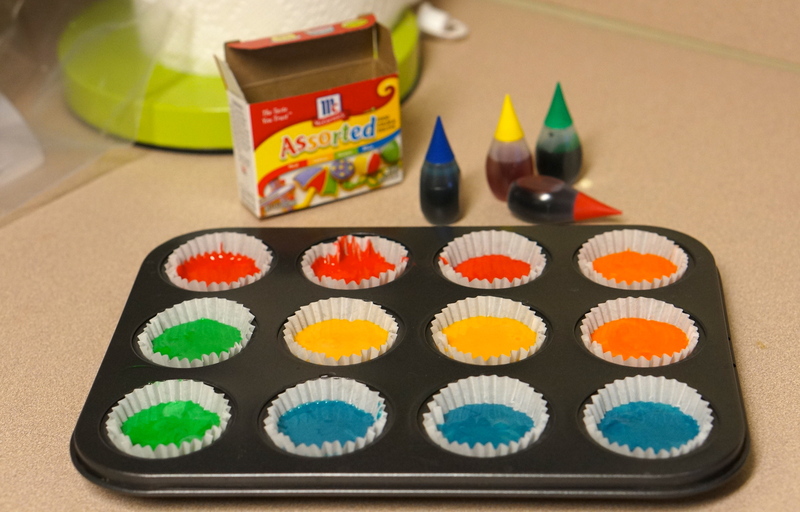 Make as many colors of cupcakes as you would like! Bake your cupcakes for a few minutes less than the box says to bake normal cupcakes (really keep an eye on them- they’re a lot smaller than normal cupcakes so they won’t take as long to cook). Dye your icing blue and frost the cupcakes once they’ve cooled. Cut the Airheads candy into strips that are about 2 inches long. Cut a few mini marshmallows in half. 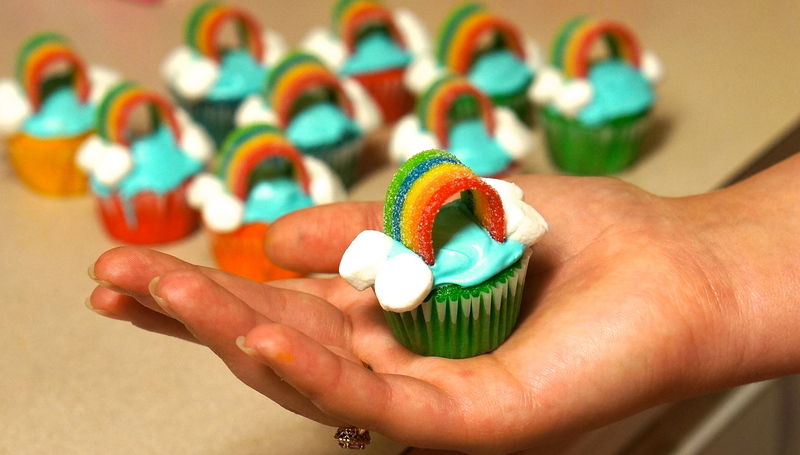 Use the mini marshmallows as your “clouds” to hold the rainbow in place on the cupcake. You’re all done! These may be one of our favorite shenanigans so far. Their cute-to-easy ratio is really awesome, which we love. 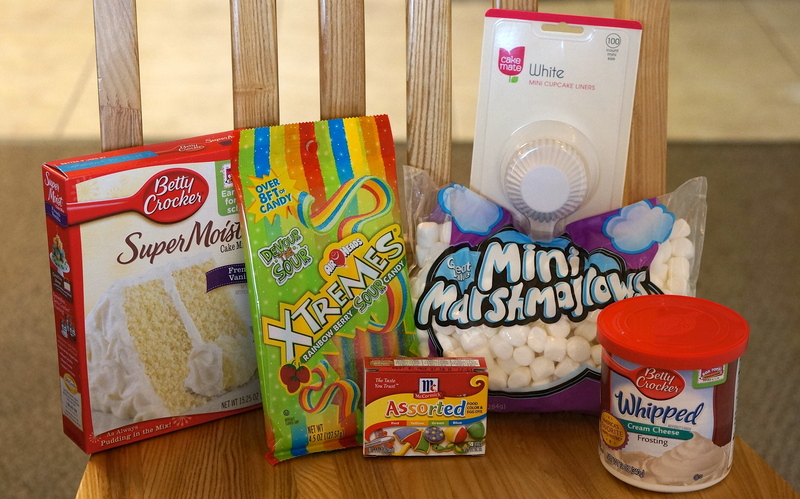 Be sure to check out some of our other baking shenanigans below! 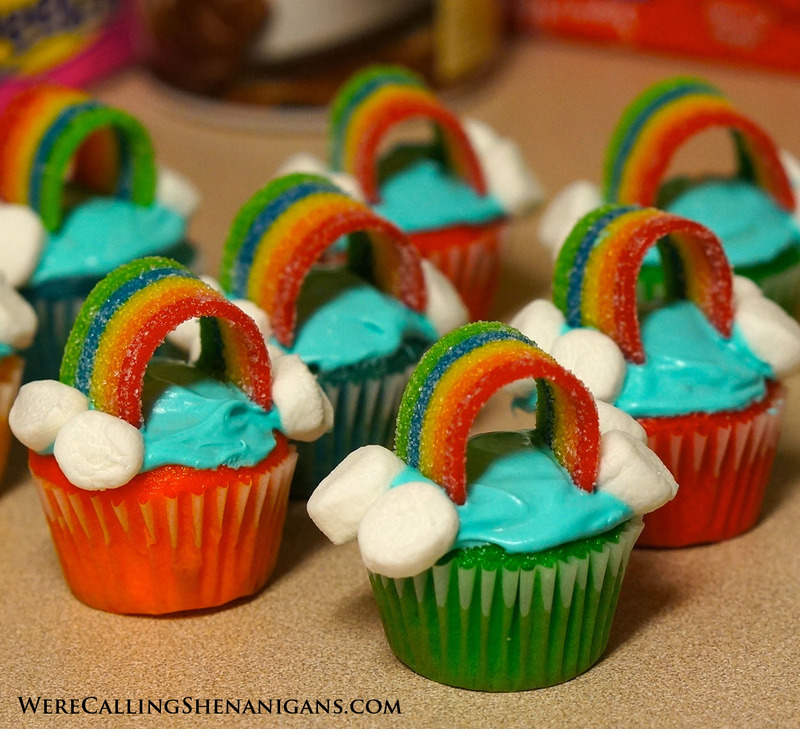 If you’re really in a summertime mood (or going to a theme party), we suggest the rainbow cake as a perfect complement to these mini cupcakes! 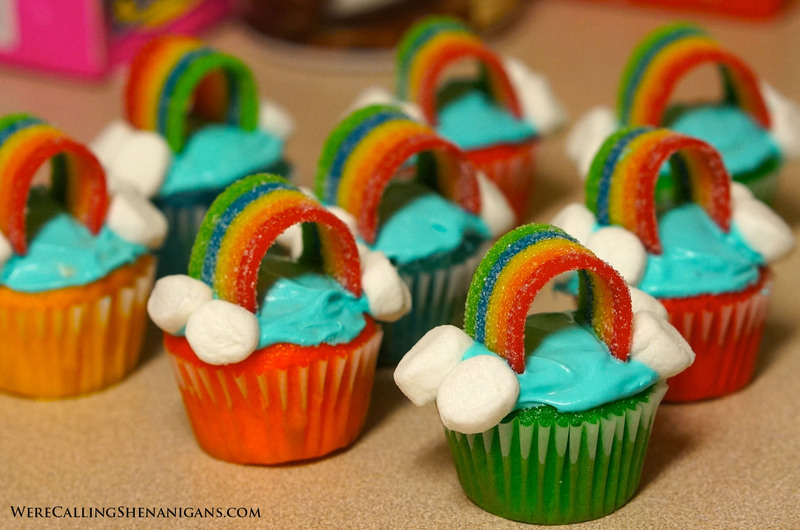 These cupcakes are so cute, colorful and look so yummy! More easy fun! Thanks again Shenanigans !!! Thanks they were really fun! These look so cool. I’m rubbish at all the cute presentation stuff but think i could manage these! I absolutely love the idea behind this blog and can’t wait to see what you try next. I did regular size cupcakes and to get the rainbows to stick well I used a knife to make slits on either side a slid the rainbow candy down into the cupcakes. I also used icing for the clouds instead of marshmallows and it held its shape well.